When Great Zimbabwe began its economic and military decline in the late 1400s, some of the city’s elites migrated 200 miles north to the Zambezi River and established the short-lived Shona state of Monomotapa (Mutapa). 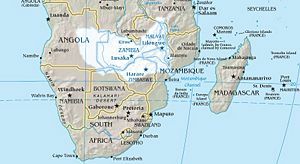 The state emerged around 1500 under Nyatsimba Mutota, the first mwene (king) who gained control of the surrounding gold producing region and much of the Zambezi River Valley. Mutota established a new capital at Zvongombe, near the Zambezi River. Growing wealthy through a system of vassalage (taxation), Mwene Matope also controlled long distance trade with special state-sponsored markets called feiras. Excavations have revealed feiras at towns along the Zambezi River including Luanze, Dambarare and Masappa. These excavations show tools such as iron tongs and fine goods such as Chinese white and blue porcelain and glass beads from India, indicating that Monomutapa continued to participate in the Trans-Indian Ocean trade that had helped establish Great Zimbabwe. By the 1590s, Monomutapa had begun a cultural, political and military decline intensified by increasingly frequent civil wars. The fragmented central government allowed provincial governors to gain more power. The political leaders of one province, Changamire, broke free and began building a successor state to Monomutapa. Additionally, the Portuguese colony along the coast gained more power at the expense of Monomutapa. By the 1630s, the Portuguese overran all of Monomutapa and appointed a new mwene, Mavura Mhande Felipe, to the throne in 1629. From that point, Monomutapa survived by exploiting the rivalries between other African states and the Portuguese. The last mwene, Mambo Chioko, was killed in battle against the Portuguese in 1917. Shadreck Chirikure, "Metals in Society," Journal of Social Archaeology 7:1(2007), Catherine Coquery-Vidrovitch, The History of African Cities South of the Sahara: From the origins to colonization (Princeton, NJ: Markus Wiener Publishers, 2005); Philip D. Curtin, African History: From earliest times to independence (London: Longman, 1995); Zibani Maundeni, "State culture and development in Botswana and Zimbabwe" The Journal of Modern African Studies 40:1 (2002); Innocent Pikirayi, The Zimbabwe Culture: Origins and decline of southern Zambezian states (Walnut Creek, Calif.: AltaMira Press, 2001). (Walnut Creek, Calif.: AltaMira Press, 2001).